2015 Huntington's Disease Therapeutics Conference: Day 3 - HDBuzz - Huntington’s disease research news. 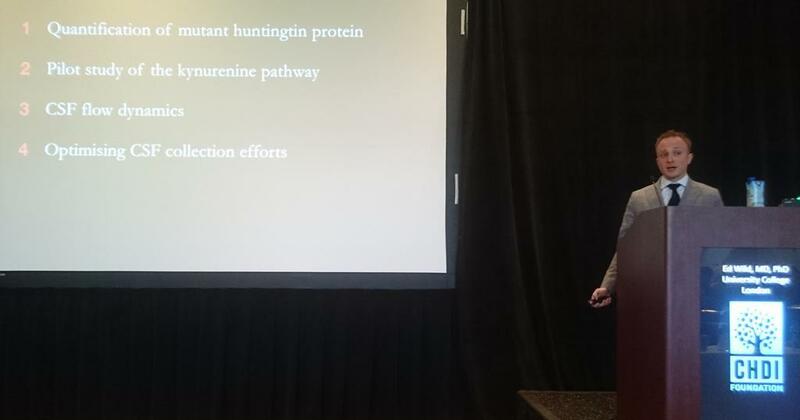 Our final report from the Annual Huntington’s Disease Therapeutics Conference. 09:06 - This morning’s sessions are focused on findings in people with HD, rather than animal models or cells. Important stuff! 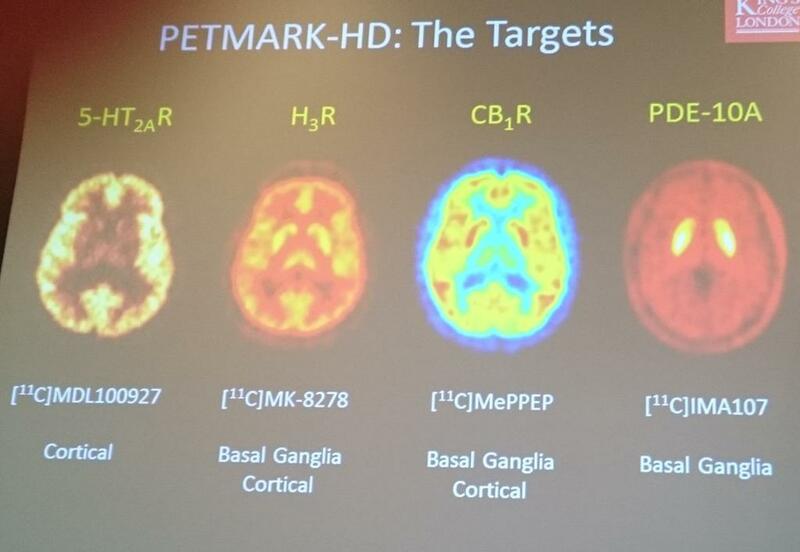 Marios Politis announced his PETMARK-HD study, which will compare multiple molecular scanning methods for the first time in HD. 09:09 - Gil Di Paolo is interested in what scientists call “lipids” and most people call “fats” in the brain. Our brains are about 60% fat. 09:11 - Brain fats come in a bewildering array of types, some abundant and some quite rare. Even rare fat types play important roles in the brain. 09:13 - Also, production of fats is slowed in the HD brain, which could result in changes in the levels of various fats in the brain. 09:16 - Di Paolo has been working with HD brains to see if it’s true that there are reductions in the amounts of important fats. 09:36 - Di Paolo just for these results 5 days ago, so watch this space for more a more detailed analysis of this exciting new results. 09:40 - Disclaimer: the next guy up is some dude named Dr Ed Wild, so beware our objectivity might be slightly compromised! 09:53 - Why is spinal fluid important? We want to learn about brains, but can’t sample brain tissue safely. Sampling spinal fluid is much safer. 1002 - The spinal fluid seems special - blood levels of the huntingtin protein don’t show the same interesting pattern. 1024 - In particular, he’s studying whether computer analysis of speech can be used to help in psychiatry. Could Siri replace your therapist? 11:23 - Diane Stephenson of the Critical Path Institute addresses the conference - her organization works to speed development of therapies. 11:29 - They try to fill gaps in the drug development process to speed the process of getting drugs approved. 12:15 - Teva lso found pridopidine may increase a chemical called BDNF, which protects brain cells. This may not happen in people though! 12:19 - So Teva hopes that damping down the activity of microglia might help brain cells to survive in HD, or even slow progression. 14:16 - Interestingly, in the TRACK-HD study found a number of brain imaging changes that weren’t associated with changes in thinking ability. 14:19 - So, how can the brain shrink without causing problems in thinking ability? Tabrizi is interested in how HD brains ‘compensate’ during HD. 14:20 - Brain imaging from the TRACKOn-HD study is being used to understand how communication between brain regions is altered in HD. 14:27 - Tabrizi’s team is interested in designing experiments that let them study how brains undergoing damage are coping. 14:35 - This suggests that brains do have some ability to cope with ongoing damage in HD, at least in some people. 14:36 - But, who cares, can this kind of information help people with HD? 14:37 - Tabrizi is interested in whether people can be trained to use these compensation techniques. 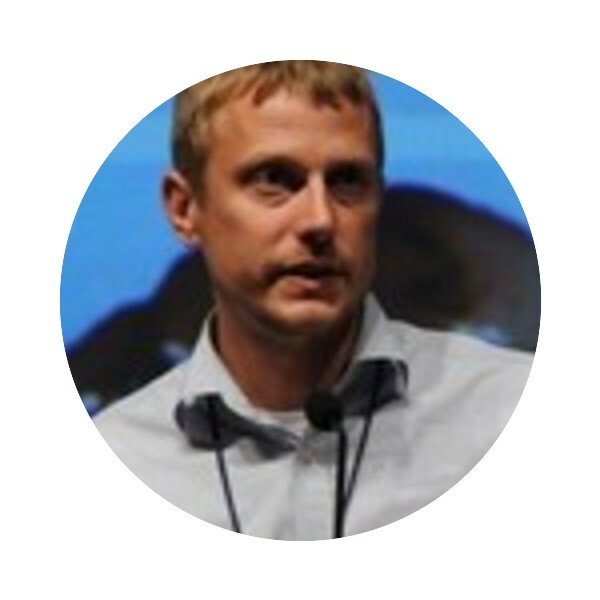 Dr Ed Wild of UCL (and co-founder of HDBuzz) reported on his work using cerebrospinal fluid in HD. For the first time, Wild and colleagues have detected and measured how much of the mutant huntingtin protein is present in the fluid. Hopefully this will help with forthcoming ‘gene silencing’ trials. 14:39 - This training led to specific patterns of brain activity, and improved performance on a simple movement task. 14:42 - Tabrizi suggests that this kind of neurofeedback study isn’t a treatment for HD, but more like “physical therapy for the brain”. 14:54 - PET uses injections of chemicals called ‘tracers’ to look at changes in specific cell types in the brain. 01:08 - In summary: trials are happening - all HD family members should think about taking part so we can get these treatments tested ASAP!